My nine year old son’s favorite book series are the titles from National Geographic Kids. He has a collection of all of his treasured books next to his bed where he reads from at least one every day. He enjoys these so much that many are lovingly worn from reading it so much. These are also his favorite books to take along with him on vacation because it is an entertaining way to pass the time on long car rides. Since he is very interested in learning about the world in general he couldn’t wait to check out a few of the newly released titles from National Geographic Kids. What In The World? 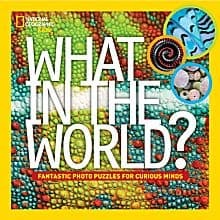 Fun-Tastic Photo Puzzles For Curious Minds (SRP $16.99) is particularly appealing to the artist side of my son. The hardcover book has amazing photographs and presents real-life puzzling pictures. This collection of “visual mysteries” is so interesting and a fun challenge for the child (and adults too as I enjoyed it just as much) to solve. There are lots of different puzzles including “What In The World?”, “Take A Look”, “Hidden Animals”, “Optical Illusions” and “Double Take”. This was popular with all three of my children who took turns trying to figure out the hidden mysteries and they also enjoyed learning the fun facts too. 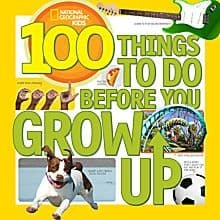 Another fun new title for young adventure seekers is 100 Things To Do Before You Grow Up (SRP $9.99) by Lisa Gerry. These interesting and inspirational ideas are very appealing and encourage children to embrace their adventurous side. My daughter, Hannah especially liked idea #12 i.e. “Ride a horse” while my boys would love to “Go Snorkeling”. It even encourages kids to make up their own list of top ten things that they would like to do which inspired all three of my children to make their own list of things they would like to do over the summer break….it sounds like it will be a busy season! For explorers, the National Geographic Kids Ultimate Globetrotting World Atlas (SRP $13.99) is packed with fun activities to keep children busy and engaged including maps, games and activities. Since we are not able to be world travelers in real life, this is the perfect way for my kids to be able to “visit” and learn about the people and places from all around the world. National Geographic Kids brilliantly presents the material in a way that makes children want to learn and explore all of the interesting information. Since we are homeschoolers, my children decided that it would be fun to put a pin on the world map we have on the wall to reflect each of the countries that they read about in this book. They are learning about the world without even realizing that this book is educational because it is so entertaining. There are so many wonderful titles to choose from by National Geographic Kids so you are invited to visit them online to purchase your favorite books. Perfect for my grandsons …. all 7 of them ! my kids would really enjoy these! we love books in our house! Hi!! The books arrived & my grandkids will love them!! !